The Dixie National Quarter Horse Show is a full seven days, Feb 12- Feb 17, that showcase the quality and physical abilities of the American Quarter Horse. We have a Special Event Roping Double Judged, additional roping classes, reining, working cow horse, ranch riding, trail, halter, showmanship, horsemanship, western riding, western pleasure, Hunter Under Saddle, Equitation, Over Fences classes, barrels, stakes and pole classes covering two arenas. 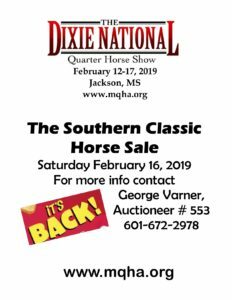 The “Southern Classic Horse Sale” is Saturday, February 16, 2019, in the Livestock Sales Arena. In addition, there is a “Shop & Watch” trade show in the upper level of the Watson Ford Equine Center, Wed-Sun. Come and shop for the most current trends in jewelry, show clothes, hats, tack, trucks, trailers, John Deere tractors. 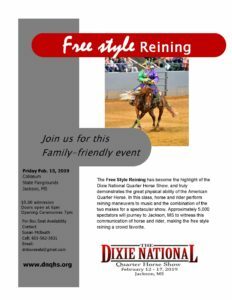 Spectator admission is free to all events EXCEPT Free Style Reining, held Friday night. Doors Open at 6:00 pm, admission is $5.00 per person.